The Belledune Port Authority (BPA) officially launched a micro web-site to promote Industrial Fabrication and the Belledune Modular Fabrication Facility this morning! Strategically Located on Arctic Shipping Gateway. The most flexible choice for moving project cargo into the Eastern Arctic, Newfoundland and Labrador. State-of-the-Art Fabrication Facilities. Learn more about the Port of Belledune's Modular Fabrication Facilities. Access to Rail and Trans-Canada Highway. 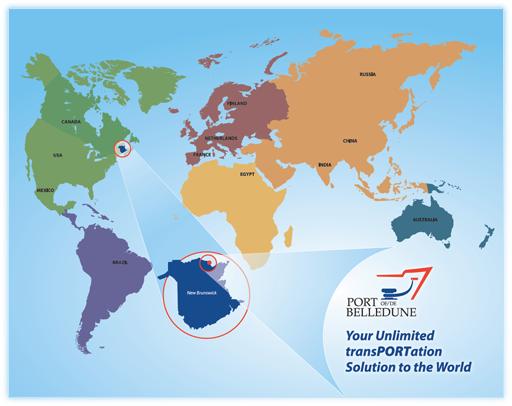 The Port of Belledune is strategically located to easily access raw materials for your fabrication needs. Easy Access to International waters.